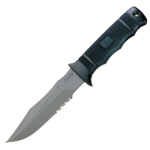 One of the most prominent survival knife manufacturing companies operating today is Cold Steel Inc. It was founded over 30 years ago and has created a huge following due to its innovativeness. The company has stuck to its main philosophy and, based on the same design method, has introduced the Cold Steel Trail Master. 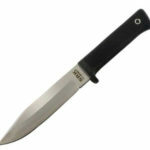 The knife has been designed to withstand the most extreme weather conditions under maximum stress. In addition, it has a shock absorbing handle that is very helpful when clearing foliage and chopping down trees. The Trail Master is made from stock removal out of Carbon V. It has full flat primary grinds along with a Kraton handle. 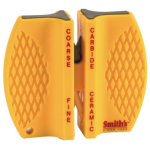 It weighs about 452 grams with a 9 1/2 inch blade that balances 0.9 feet in front of the guard. The edge is 0.045 inches thick and ground at 36 degrees. The Trail Master comes with highly polished and very sharp edges. When utilize for extensive woodworking, it does not suffer any excessive roll or edge chipping. People also like the flat ground bevel and the broad clip point on the blade that is extremely resistant to breaking and bending. The tip is actually thicker near the point than other knives. This does not mean that the Trail Master is blunt or dull. The SK-5 steel used in this knife has a carbon content of 0.75 percent and 0.81 percent magnesium content that makes it very strong. The knife’s point is almost needle sharp and provides tremendous penetration. Aside from that, the black blade is made with a false slightly-concave edge that measures three and a half inches long. 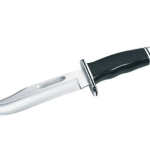 The knife has a well-designed Secure-Ex sheath that enables people to unsheathe the knife quite easily. 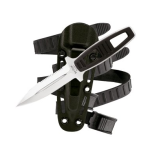 Thanks to this design, people are best equipped utilizing this survival blade where resistance and strength in impact is needed. Aside from that, the sweep on the blades makes this a good skinning tool. The Trail Master was subjected to heavy stabs in medium to soft density wood followed by strong side pulls to break the wood out. These tests show that the Trail Master is more efficient as its length gives it a high level of precision. The penetration was very high due to the thin lips, and they are very easy to grow due to its tapered grips. The blades are also strong through the full body and can take heavy side pulls while lodged halfway in an old stump. The checkered Kraton grips are decently secure at hand. The grip has double, short quillions made from a single brass oval that goes very well with the overall knife construction. It also has a handle design that enables the knife to absorb shock when chopping wood. Aside from that, the grips are not immediately abrasive like those found on other knives. It also has a contoured cross section that helps prevent the Trail Master from turning or shifting in the hand when striking full-power blows. However, they have a tendency to get slippery with extended work because they are tapered, and the checkering can be very abrasive. What is worse is that the handle bond can begin to fail and the grip can become rotated around the tang after a couple of weeks of use. As use continued, the Kraton continues to wear at a fairly rapid pace and can become slick quickly. To solve this problem, a lot of users suggest that the handle would benefit significantly from a more contoured grip. The double guard is quite sturdy and rigidly fixed in place. It is also long enough to keep fingers off the blade but short enough to avoid being tangled in clothing or equipment when the knife is drawn. Although it gives a high level of security, some users complain that it inhibits various grips that they can use with other knives. 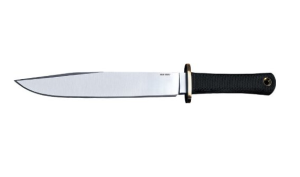 All in all, the Cold Steel Trail Master is indeed one of the finest survival knifes available at the moment. If gets full marks from a lot of people due to its slim, long clip point. Considering the toughness of the steel along with its shock absorbing capability, this one is a winner all the way. If a person is thinking about purchasing a good knife that absorbs shock very well, they can definitely count on the Cold Steel Trail Master to be there at their side and perform when they need it. Many of the links that you'll find on Knife Den link to products on third party sites. If you choose to purchase a product after going through one of these links, we will receive a small sales commission at no extra cost to you. We also have financial relationships with some of the brands you see on the site. We thank you for supporting our business! Knife laws change constantly, and you are responsible for confirming any information you find on our site about law with your local jurisdiction. © 2019 Knife Den. All rights reserved.